The Indy Ad Show is the nation's premier show to find vintage and antique advertising. Over 250 antique advertising and toy dealers from around the country come together to provide collectors with a great opportunity! So if you are looking for the unique, the rare, or those special mint condition items, you need to attend the 49th Annual Indy Ad Show. This show promises to be a great presentation of early and vintage Petroliana. While you walk down memory lane you will discover gas pumps, oil cans, great signs, and advertising of all kinds. A fun and exciting show to buy, sell and trade at. For more information visit Boone County Gas and Oil Show's website. The 13th Annual Gasstuff.com Petroliana Fest will be at Historical Route 20, Bouckville, NY on Saturday from 7am–? A 33-year tradition since 1986. The Check the Oil Show & Auction, held at Dublin Embassy Suites in metro Columbus, is "Check the Oil" magazine's acclaimed International Petroliana Collector's Show. For more details please visit the Annual Show page on our website which will be continually updated with more updates as we have them! Or email us your questions at info@ctohotline.com. The 33rd Annual Iowa Gas Swap Meet & Auction will be held in Des Moines, Iowa. For more information visit www.iowagas.com. The Indy Ad Show is the nation's premier show to find vintage and antique advertising. Over 250 antique advertising and toy dealers from around the country come together to provide collectors with a great opportunity! So if you are looking for the unique, the rare, or those special mint condition items, you need to attend the 48th Annual Indy Ad Show. Join us for the 27th Annual IT'S A GAS! SWAP MEET at the Cowan Civic Center, in Lebanon, Missouri. 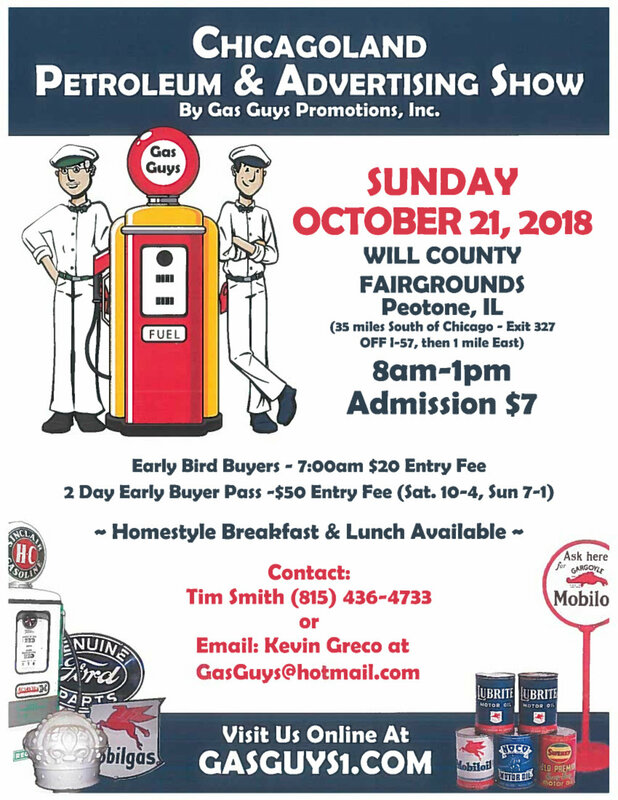 Selling Petrolania and offering all things associated with the gas and oil collector's hobby, including good advertising, nostalgia, coin op, vintage toys and other related items. We invite you to attend our antique sporting and advertising show on February 1 & 2, 2019 at the Sunnyview Expo Center in Oshkosh, Wisconsin! Friday, February 1 - 10 a.m. to 6 p.m.
Saturday, February 2 - 9 a.m. to 3 p.m.
For vending and booth spaces contact Henry Bunn 919-495-5891 or Dan Black (dan@circadesigns.com) 252-258-0897. "Home Style Breakfast & Lunch Available"